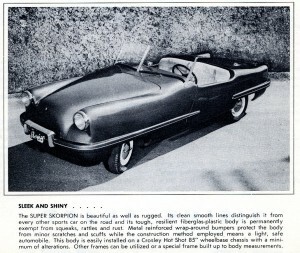 In a recent story here at Forgotten Fiberglass, we reviewed the debut date of the Super Skorpion which was late in ’52. Click here to review that story. 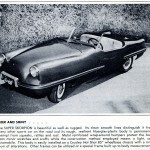 Today’s story is a follow-up showing the next printed brochure for the Super Skorpion – this one from 1953. The Super Skorpion is distinguished by two important features; its light weight combined with strength and its beautiful appearance. 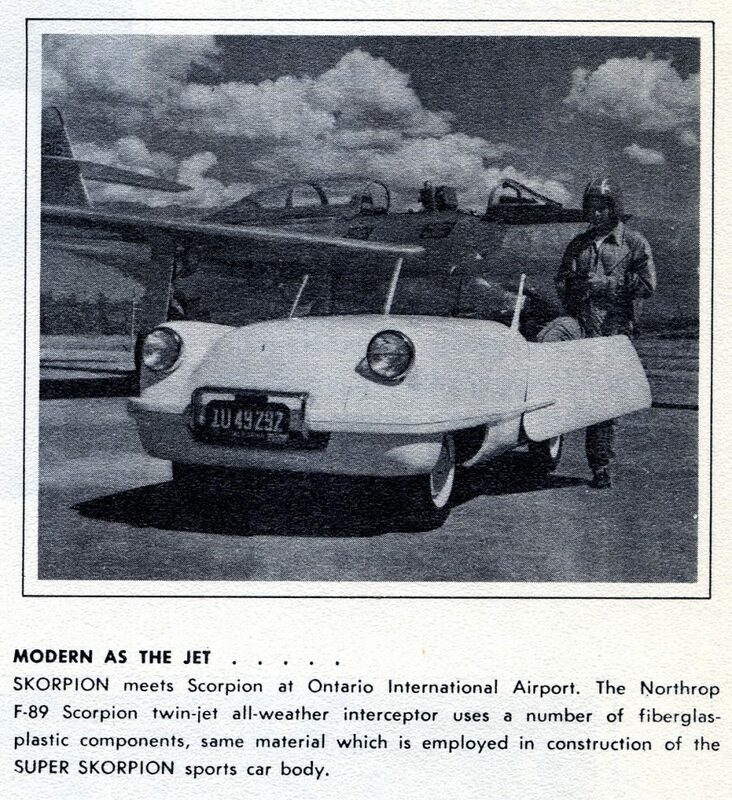 Strong, tough, shock resistant fiberglass-plastic is the basis of Skorpion construction and the clean flowing lines of modern sports car design are its trademark. No other car on the road offers so many advanced design features at such a low cost. 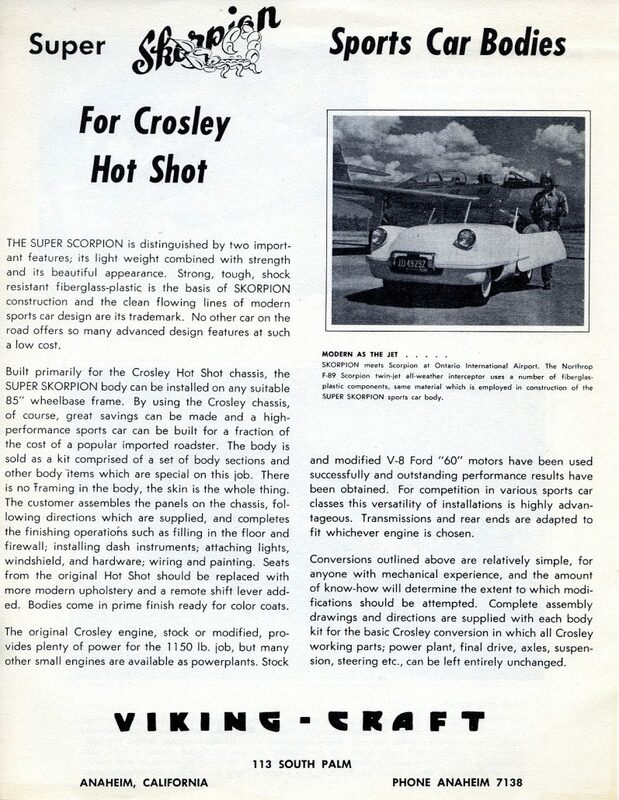 Built primarily for the Crosley Hot Shot chassis, the Super Skorpion body can be installed on any suitable 85” wheelbase frame. 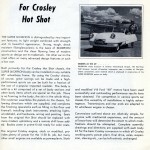 By using the Crosley chassis, of course, great savings can be made and a high performance sports car can be built for a fraction of the cost of a popular imported roadster. The body is sold as a kit comprised of a set of body sections and other body items which are special on this job. There is no framing in the body, the skin is the whole thing. The customer assembles the panels on the chassis, following directions which are supplied, and completes the finishing operations such as filling in the floor and firewall; installing dash instruments; attaching lights, windshield, and hardware; wiring and painting. Seats from the original Hot Shot should be replaced with more modern upholstery and a remote shift lever added. Bodies come in prime finish ready for color coats. 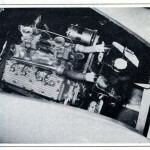 The original Crosley engine, stock or modified, provides plenty of power for the 1150 lb job, but many other small engines are available as powerplants. Stock and modified V8 Ford “60” motors have been used successfully and outstanding performance results have been obtained. For competition in various sports car classes this versatility of installations is highly advantageous. Transmissions and rear ends are adapted to fit whichever engine is chosen. Conversions outlined above are relatively simple, for anyone with mechanical experience, and the amount of know-how will determine the extent to which modifications should be attempted. Complete assembly drawings and directions are supplied with each body kit for the basic Crosley conversion in which all Crosley working parts; power plant, final drive, axles, suspension, steering etc., can be left entirely unchanged. 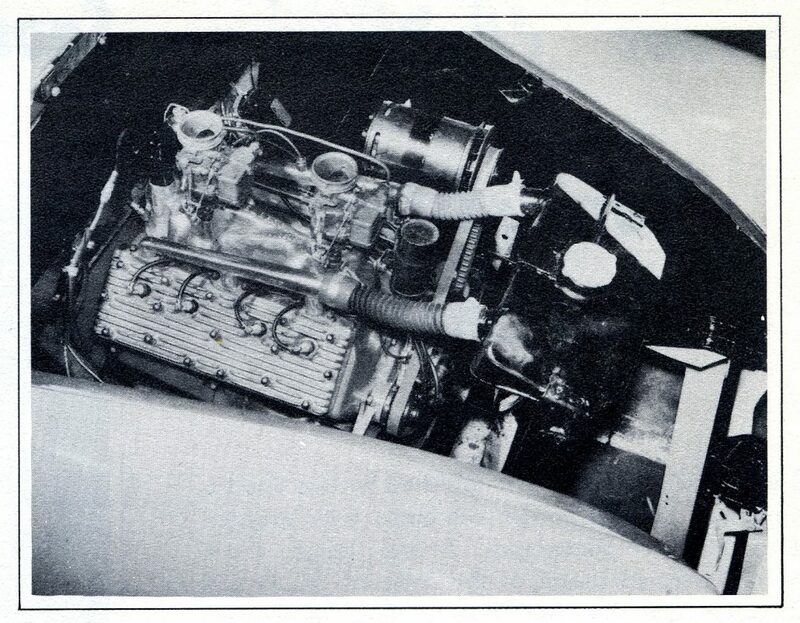 Installation of a Ford V8 “60” poses only minor problems. Space under the hood is ample to accommodate the powerful little engine which gives corresponding greater performance. Other Ford parts used are transmission, drive shaft and narrowed rear end. Addition of dual carburetor manifold, high compression heads and reground cam raises horse power output 75%, giving an outstanding power-to-weight ratio. 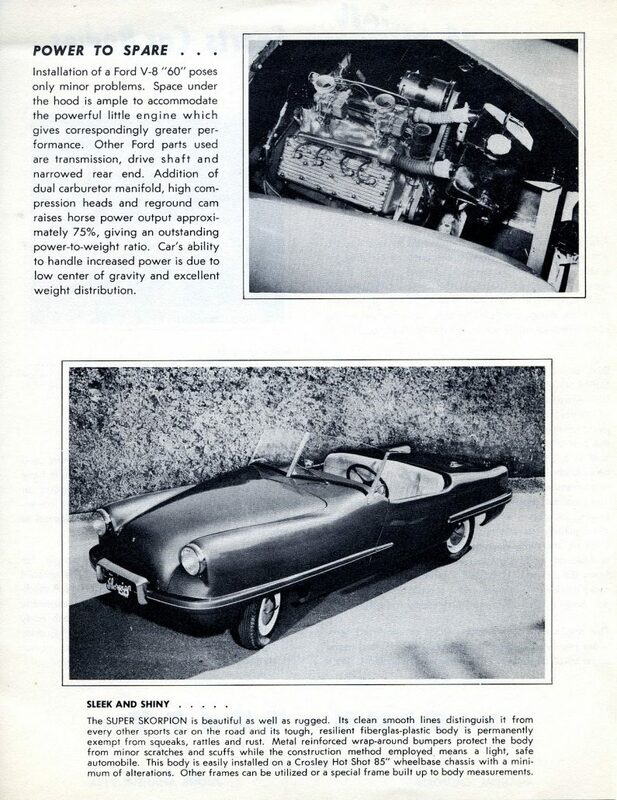 Car’s ability to handle increased power is due to low center of gravity and excellent weight distribution. The Super Skorpion is beautiful as well as rugged. Its clean smooth lines distinguish it from every other sports car on the road and its tough, resilient fiberglass plastic body is permanently exempt from squeaks, rattles and rust. Metal reinforced wrap-around bumpers protect the body from minor scratches and scuffs while the construction method employed means a light, safe automobile. This body is easily installed on a Crosley Hot Shot 85” wheelbase chassis with a minimum of alternations. Other frames can be utilized or a special frame built up to body measurements. 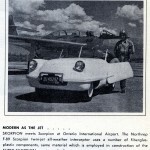 You know we’ve seen a lot of fiberglass sports cars here at Forgotten Fiberglass, but not any Super Skorpions. There are plenty of “Skorpion” sports cars out there and they’re neat to see every time – but only rumors of Super Skorpions seem to exist. So….for any of you “Super Skorpion” owners out there….let us know who you are and drop us a line here at Forgotten Fiberglass. We’ll do a feature on your car and show the world what a special “pocket rocket” you have in every way. 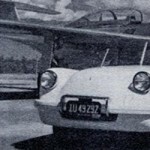 * Click on the following link to view all stories on: Wasp and Skorpion Sports Cars – Viking Craft Too! Thanks for posting. 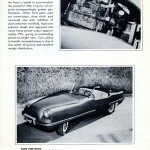 I had one of these with the Ford 60 drivetrain. It was something I was working on in my teens but never completed it to running condition. It went the way of so many other treasures after the death of my father.